How epic is epic? Once you name yourself, it is hard to live up to it. Look at "Baddest Man On The Planet" Mike Tyson, he was bound to face a furore when he inevitably slipped. What about Ethelred The Unready? Did this King leave all his battle packing to the day of the fight? 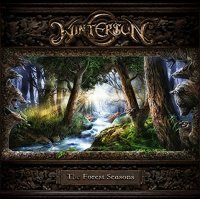 Finnish Metallers Wintersun take the epic tag seriously; no EP's for them, this is a suite of four pieces, each between ten and twenty minutes long and linked with a theme about nature, death and growth (okay, mainly death). They don't rush things; this album comes five years after their second release which came eight years after the debut. You can hear the finely crafted sounds all over this; they take meticulous care to create an atmosphere, this is a banquet, not a snack and it should be taken in one mammoth sitting. Not quite Stravinsky's 'The Rite Of Spring' or anything, but sometimes these four seasonal pieces are a little similar, mind you, we seem to be heading that way anyway and it's a minor quibble really, considering the undertaking here. The question you may be asking is what do you get within this release? The answer is a combination of dense, almost Gothic moods with Celtic airs in 'Awaken From The Dark Slumber (Spring)', nice choral warbling and breast-beating in the more open 'The Forest That Weeps (Summer)', 'Eternal Darkness (Autumn)' with its majesty, tumbling pushiness, choir and glacial approach, and lastly the slow march and almost musical theatre end of 'Loneliness (Winter)'. It is, though, almost nonsensical to mention bits in such an overwhelming whole. The atmosphere is constantly brooding, Jari Mäenpää's faux demonic growls, love or hate 'em, unsettling in a sense that something is about to happen and it won't be good. However, the clean vocals remind you that there's nothing to be that frightened of after all. This isn't about band performances, this is about music to fit an almost filmic vision. That it's manages that in less than an hour, with a welcome accessibility, is refreshing; epic can be what you want it to be, this is their interpretation.